Chialingosaurus kuani, meaning chialing lizard, was a 4 meter long, asian stegosaurid. He was a plant eater that ripped off soft plants from the ground. 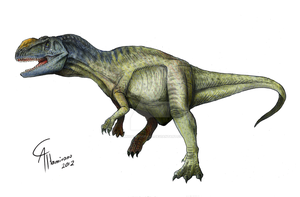 Chialingosaurus lived in the jurassic period in china. He had six pairs of plates and seven pairs of long spines from his hip to the tail. Though the spines look a bit exaggated (spelling? ), i love it. Great job! 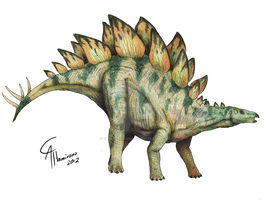 thank you, well I am not pleased with the head of my chialingosaurus but I think that the spikes look very good.